Rides in Magic Kingdom ABSOLUTELY Worth the Wait Times! One negative thing that I hear people say about Disney parks is “The lines are so long!” or “I don’t want to stand in line all day.” Fair enough. I wouldn’t want to wait in line all day either if it was for something boring like paying speeding tickets or exchanging clothes the day after Christmas. BUT lucky for us, Disney parks are NOTHING like government registry offices or shopping malls filled with angry shoppers! Disney parks are magical places filled with amazing details everywhere you turn - including the queue lines for rides and attractions! Disney parks are magical places filled with amazing details everywhere you turn - including the queue lines for rides and attractions! (which is a whole other blog post for another day!) But I understand that when you’ve got limited time you don’t want to feel like you’re simply moving from one line to another without something amazing at the end of that queue! So, my husband and I got to chatting about rides in the Magic Kingdom that we think are worth the wait. So here are our top picks for rides that we would happily get in line for no matter how long it is! The number one ride that my husband Tyson and I will ALWAYS stand in line for is Peter Pan’s Flight. The number one ride that my husband Tyson and I will ALWAYS stand in line for is Peter Pan’s Flight. This ride is found in Fantasyland, doesn’t have a height restriction and is appropriate for all ages. This ride takes you on an adventure through the nighttime sky over London, past the second star to the right and into Never Land where you soar past the Lost Boys, Mermaid Lagoon, Skull Rock and the Pirate’s Cove. The ride is magical (likely because of the pixie dust sprinkled on your ship to help you fly) and every single time I ride it I leave with a huge smile on my face and a full, happy heart! If you are a fan of the classics or want to introduce your little one to the world of Peter, the Lost Boys and Never Land this is a MUST DO in my opinion! The second ride that we will ALWAYS stand in line for is The Haunted Mansion. The second ride that we will ALWAYS stand in line for is The Haunted Mansion. This ride has grown quite a cult following and is incredibly popular because of its spooky theme and unique characters (of which my favourite are the Hitchhiking Ghosts!) 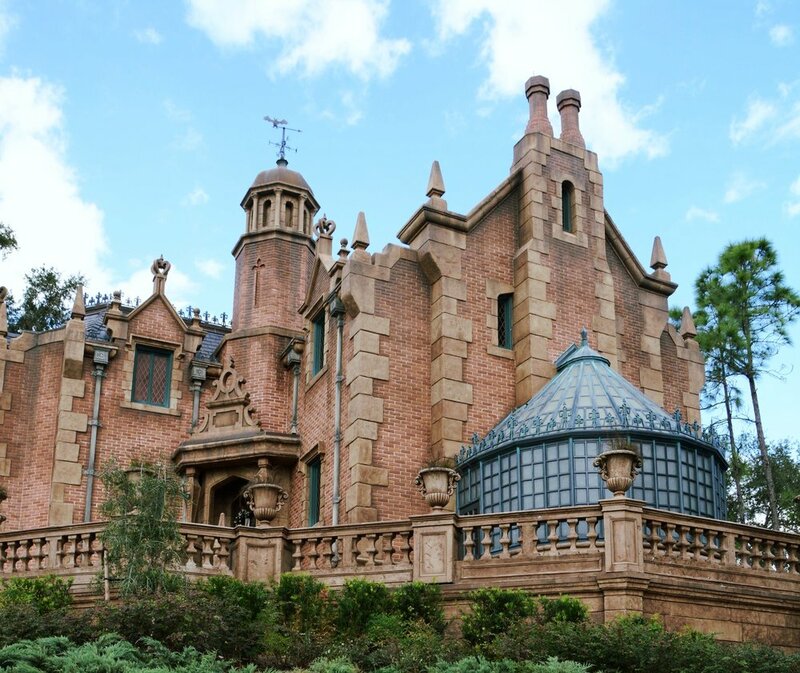 This ride is found in Liberty Square, doesn’t have a height restriction, and while it is open to all ages you may want to consider riding through it first to check it out if you have small children who may be scared by the dark, spooky noises or ghostly characters. This ride takes you through the Mansion which is an abandoned residence full of ghosts (999 to be exact and there’s room for just one more...) After starting in a chamber that has some unique and creepy features you board a Doom Buggy to take you through the Mansion which is full of weird and wonderful rooms including a creepy conservatory, a seance room, the grand ballroom (my personal favourite! ), a dusty attic and finally the liveliest graveyard you’ve ever seen! If you’re a fan of the creepy, ghostly and spooky this is a ride you will not want to miss! The third ride that we LOVE and will wait in a queue line for every trip is Big Thunder Mountain Railroad. This ride is found in Frontierland, does require that riders be over 40 inches (102 cm) tall, is appropriate for kids, teens and adults and does feature some drops, sharp turns and high speeds. You board a train for the wildest ride in the wilderness as you are taken through an abandoned mine shaft filled with bats flitting around while on a rickety track before zooming in, around and through canyons and caves in the desert, past an abandoned mining town (which I recently learned is a town called Tumbleweed!) before you safely arrive back at the station. As someone who doesn’t love roller coasters, I can honestly tell you that this one is a ride I will never miss! It is fast, there’s a lot of sharp movements and drops but there are no loops which is a detail that I think is important if you aren’t completely sure about riding coasters. This is a good “starter” for those that are just starting out with bigger thrill rides. The third ride that we LOVE and will wait in a queue line for every trip is Big Thunder Mountain Railroad. The fourth ride is my husbands bonus pick, Splash Mountain. I personally don’t love this ride for the simple fact that the drop makes my stomach jump into my throat and while SOME people love that feeling, I do not! But my husband, my brothers, my sisters, my mom, my dad - they all LOVE this ride! This ride is found in Frontierland, does require that riders be over 40 inches (102 cm) tall, is appropriate for kids, teens and adults and does feature water that you float through, some dips and one five story waterfall drop. You start out by boarding a hollowed-out log and begin your journey through Splash Mountain which is home to Br’er Rabbit and a cast of musical, whimsical characters who provide the light hearted and upbeat soundtrack for your journey to the main attraction - the drop! No matter where you sit in this ride you will likely get wet, but if you want to try and minimize how wet you get, I would try to sit in the back rather than up front in your log. So, there you go, our top picks for rides in the Magic Kingdom that will be worth the wait! What are some of your favourite “worth the wait” rides in the Magic Kingdom? I’d love to hear which rides are your absolute “must-do’s”! Hello! My name is Jenn Denis and I’m a Disney fanatic. My mom raised us with a borderline obsessive love for Disney and now myself and all my siblings are doing our part to keep that love alive! I first went to Disneyland in grade ten and left a bit of my heart there the minute I stepped through those gates. Since then we’ve returned to Disneyland year after year (my husband Tyson and I even went there on our honeymoon!) and it truly is my home park. We visited Walt Disney World in Florida for the first time in 2016 and were lucky enough to go twice this year in 2018. I love both parks and am constantly dreaming about and planning for our next trip whether its to California or Florida – if there’s churros, a castle and a little pixie dust, I’m home! Older PostMagical Days in the World | Give Yourself a Break!